Heat chicken as directed on package using microwave. In large bowl, combine all ingredients except tortilla chips; toss gently. Top with tortilla chips. Refrigerated chicken breast strips can be used in place of frozen strips. Diced white Cheddar cheese can be used in place of feta cheese. Add 1 teaspoon of chopped fresh basil and 1 tablespoon of chopped sun-dried tomatoes with the white Cheddar. 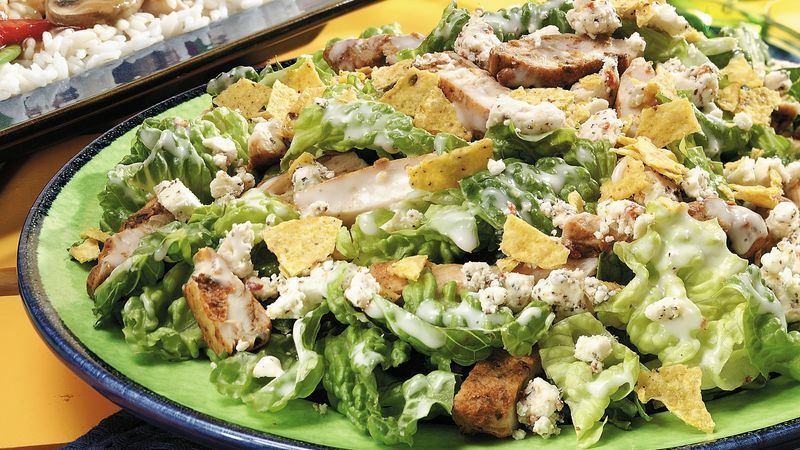 To reduce the fat by about 7 grams per serving, use light Caesar salad dressing instead of the regular. Blueberry-corn muffins and lemonade complete this menu.